I'm keen to get the chirp when locking/unlocking my car. I find myself pressing the button about 3 times, "Just to make sure.." A chirp would give an audible confirmation, and put my mind at rest. 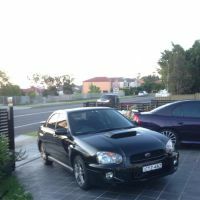 There is instructions online for 08 Legacy, Impreza, Forester(?) to enable/disable the noise via a sequence involving the key in the ignition and holding the lock button on the door. No luck. 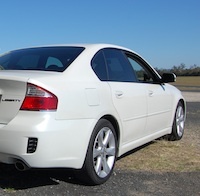 It seems like this was standard on practically every USDM model Subaru... Seems like the ADM missed out. The OEM buzzer sits just behind their grill, on the vertical support bar. We have the mounting hole, just no buzzer. I hoped I'd find the wires in the vicinity anyway but no luck. I also found an old page where an Aussie guy had added a piezo buzzer to the solenoid in his Outback's tailgate. I'm sure that on a sedan this would make a noise only when opening the boot, and not when locking/unlocking the main doors. Also found another site where Mini owners were adding it to the fuel cap solenoid… Either way, it just gives one loud tone for lock, and one quieter tone for unlock. Then theres this, which I'm keen on as it would appear to be factory.. DIY chirp with indicator flash. "...The short version is that you install a 12VDC low current ‘tone’ buzzer across the coil of the Remote Keyless Entry Relay. This is the relay that blinks the front & rear signal lights 1 time when the doors are unlocked and 3 times when locked by the remote…"
So, finally- my question is this: Do we have such a relay? And if so, is this possible? I have the buzzer sitting in the garage, just haven't had the knowledge to go at it..
Last edited by tony_m on Sat Jan 25, 2014 1:42 pm, edited 3 times in total. Re: Lock Chirp - One for the auto-electrical guys. my GT Legacy had a lock piezo in the drivers door. But that was integrated as part of the JDM central locking system, which also featured a coded door handle. 4 digit code entered by pulling up the drivers door handle great for going to the beach so you CAN lock your keys in the car when you go to the beach. That's my plan. Just chasing details! I have OEM nav and the option is in one of the menus... Either that or it an option for indicator flash on lock. would make life simple if someone made a photo guide ! I also want this for the same reason. Though I figured I'll eventually probably get th functionality from an alarm anyway. Thanks Ben. Let us know how you go - ADM GT's must have this from factory... Seems the rest of us plebs miss out! I just need to find out how to get power through the piezo, from the indicators, but only when locking/unlocking - i.e. not when I indicate while driving! Probably better off getting the impulse from the door lock solenoid, and maybe using a relay to trigger a piezo. Iirc there's a jaycar kit how-to on the Autospeed website. Nice one mate, cheers. I'll have a look and report back. I have probably spent a few hours in total looking around, and haven't come across that site yet. Keen to see what I can find! 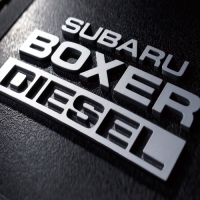 Too much time researching Subaru-specific! This is the goods. Although it won't sound factory, it will definitely address the issue. A buzzer that sounded nicer would be great too, piezo tones are awful lol. Anyway- I'm set. Will post up pics for the other guys, at least that way it'll be easier to follow for our cars. How about an alarm siren or eg the horn? Re: Lock Chirp - Solved for now! Just finished the piezo buzzer install, inline with the door lock motor. If anyone else is keen, I took a few pics along the way. It looks like this, and costs $4. Firstly, remove the door card, being careful of all electrical cables and plugs. Instructions only a search away if you've not done it before. I have used the rear passenger door, as my front doors are completely Dynamatted, and I didn't feel like taking that off to get into the cavity. Peel back a portion of the plastic layer. Cutting the black adhesive is the easiest way, as it all sticks back together anyway. This is the plug providing power to the locking motor - find it and remove. It's got a clip on the outward-facing side, but its not a difficult one. In this picture, I've already removed a little white cover which you will find sits in the centre of the plug. Just pulls out with needle-nose pliers. Run the wires for the buzzer through the 2 (convenient) channels either side of the clip, bend the very end of the wire into a U-shape, and sit it in the top of the contacts. Black on the left and red on the right. Use the white centre cap to hold it all in place. Now's a good time to make sure that it all works, and the connections are good. If your door is open, you'll have to hold the button on the car which turns on/off the light, or it will ignore you trying to lock the car. If it's wired properly you'll hear a loud beep on lock, nothing on unlock. If you have them around the wrong way it will sound on unlock, and not when locked. Plug everything back into the lock motor, test again, and attach the buzzer to the inside of the door cavity using double sided tape. And obviously put your door back together. While not excessively loud, it does the job. Easy, effective and quick. Took me 15 mins total. Edit* Just had a quick (windy) field test... Buzzer is a little quiet, I'd suggest grabbing a louder one if its available. Couldn't hear it until I was almost at the car. Will probably get a different one next time I go past JayCar. If all you want is confirmation as you lock and leave the car, then the small one is fine though. All good. After a few days, I'm used to the volume when locking and leaving, and it's fine. Definitely recommend.